The third character in this story that we must look at is the hero, David. He is a very different person than Goliath. 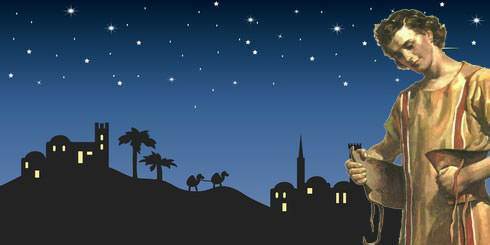 In reading about him in the Bible we discover that he was born in Bethlehem. Jesus' birth made this town famous but in David's day it was just an ordinary little village. David was the youngest of eight boys. How would you like to have seven older brothers? Because of these seven older brothers he wasn't able to say that he was the biggest, greatest, knew the most, etc. Instead I am sure he was taught just the opposite. The question is, "What was David going to do with this information concerning his place in the family?" He could have spent his life feeling inferior, full of fear, self pity, or any number of other things that could bother someone in his position. Instead, he does something that many a little person has done: he put his faith and trust in someone else. Who? God! This was the greatest decision that he made. Often those of us who have problems that are bigger than ourselves put our trust in the wrong person or thing, and we go from the "frying pan into the fire." David put his trust in the One who is faithful and true. Goliath's philosophy was, "I will save myself." 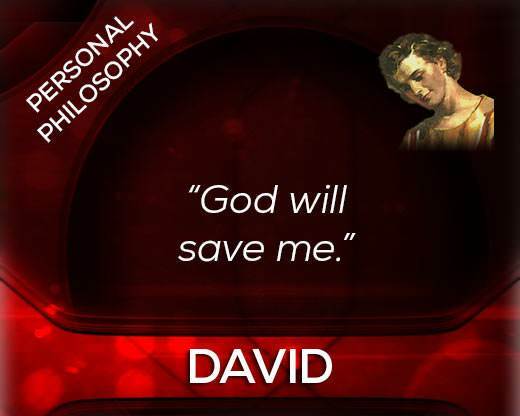 David's philosophy was, "God will save me." What a difference this made in these two men's lives! Because David was just a little fellow he was given the little tasks around the farm. I can imagine what they would have been: get in the wood, haul the water, look after the sheep, etc. Speaking of sheep, this became one of his main tasks as a young fellow. David wrote Psalm 23 (click link) and it is a psalm all of us should memorize. 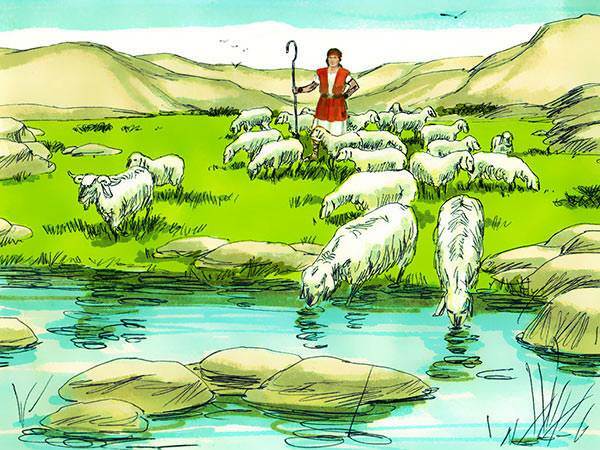 In it David reveals that the Lord is his Shepherd. 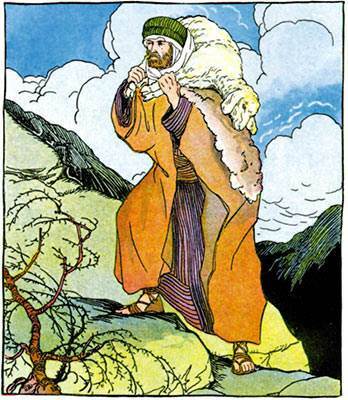 He found out that the shepherd can help the sheep that stay close to him—the ones that are close enough to hear his voice, take his instructions, heed his warnings, and follow in his paths. He soon learned that the sheep were incapable of living on their own, and those who tried often ended up in grave trouble. I'm sure when he found a lamb that had been killed, or badly wounded, he would say to himself, "This didn't need to have happened. If only it had listened to the shepherd it could have been so much better off." David came to see that if you wanted the blessings that the shepherd had to offer, obedience was required. Trust and obey are the two things that are emphasized over and over again in David's writings. 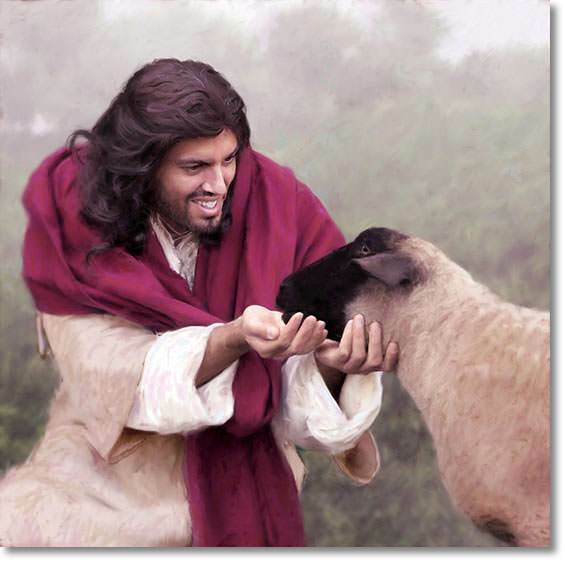 Is it any wonder that when God was looking for someone who would trust and obey Him so that He could work through him, He found the shepherd boy who had learned so many things from the sheep? David, in all sincerity said, "The Lord is my shepherd, I shall lack nothing." It was said by one who was talking from experience. He came to this place realizing that if he was going to be successful, he was going to need God's help. Many of us think that we need to be something in ourselves in order to receive His good things. Obedience and faith seem to be the things God is looking for. Obedience comes from finding out what God wants us to do, through the studying of His Word. Faith as well comes from reading God's Word. By reading the Bible we learn of the great things God did for those who put their faith and trust in Him. 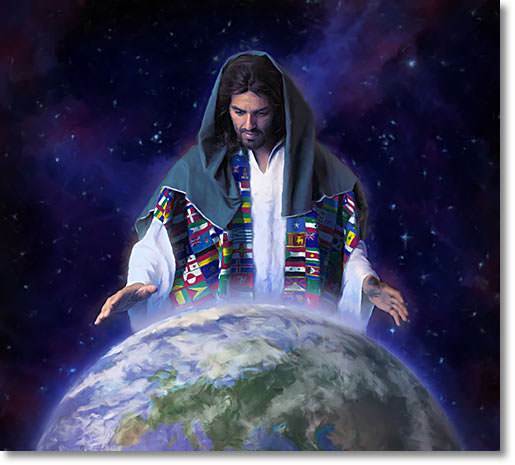 These accounts tell of individuals, families and nations for whom God did marvellous things because they put God first. 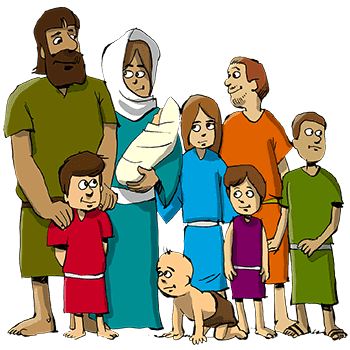 Perhaps this is the reason why, later on, the young shepherd boy was chosen instead of the older brothers, or anyone else in Israel. David is referred to as the person after God's own heart, or one who pleased God. As I said in Lesson 2, I like to think of this as one who loves the things that God loves, hates the things that God hates, chooses the things that God would choose, and desires the things that God desires. The nearer we get to God the more we will come to be in tune with Him. We get to know God through His Word. How well do you know God's Word? That is probably how well you know Him and how to please Him. "The eyes of the Lord (God) run to and fro throughout the whole earth, to show Himself strong on behalf of those whose heart is perfect toward Him." Wow! what a verse! David believed it, David experienced it. If you and I will take God seriously, seek to get to know Him and practice a life where we are concerned about God's opinion of what we are doing, and not just what we can do without others finding out, we too could experience what David experienced. 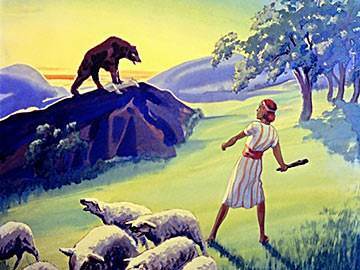 David was tested to see if he would trust God in small things, such as when he met the mountain lion and the bear. He probably had even smaller things than this to begin with, but the Bible tells us of these two. What does God see us doing when we have a problem? Trusting Him or faithlessness? How can God fulfill 2 Chronicles 16:9 in our lives if we do not trust Him when we have a problem? By now you can see that meeting Goliath was just one more event in the life of this youth who had found his God bigger than any problem that he had faced in the past. Each victory and answer to prayer helped develop his faith. I'm sure, if we asked David how he killed Goliath, he would tell us that the Lord did it. He would tell us that without his faith in the Lord he wouldn't even have been there. When the Lord is in things, the big problems are little ones. 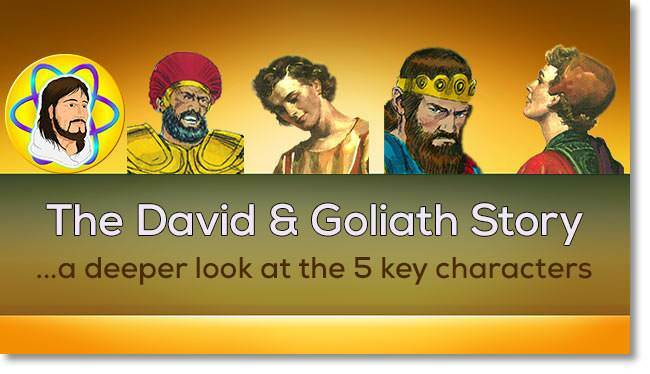 It is interesting that Goliath even provided the sword to finish himself off! Here at David & Jonathan, we say, "U.B. 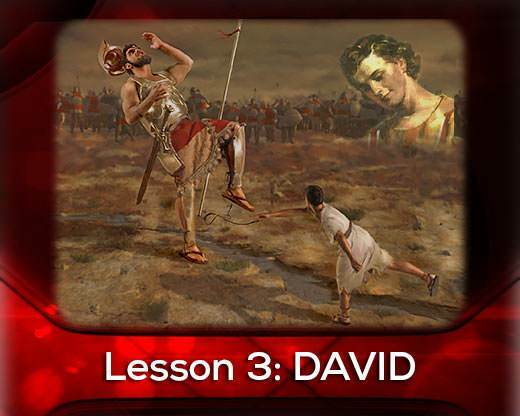 David"—A Person After God's Own Heart, or one who pleases God. If you would make David's desire your desire and find out from the Word of God how He wants you to live, I'm sure you will be able to tell your story of the faithfulness of God, just like he did. Remember, God saved David from a mountain lion, a bear, Goliath, King Saul, King Saul and 3,000 men, from himself in the cave of En Gedi…and if He did all this, then He could save you! The cave of En Gedi is an important event because it tested David as to what he would do when he could save himself in the flesh (by his own self-will). The story is told in 1 Samuel 24:4–12 (click link). Many of us call on God when the problem is bigger than we can handle, like a mountain lion or a bear. But there are other times when we think we can handle the problem without God and so we take things into our own hands. This shows whether we really are practicing the "God-will-save Life". Remember, David was cutting off the hem of King Saul's garment when it seems that God said to him, "Saving yourself David?" WOW! No one is really ready for spiritual leadership until he learns the lesson of trusting God in ALL situations. David was very close to failing the test and it seems that God decided to run it by him a second time. Read about it in 1 Samuel chapter 26.